1951, Recieved USAF commission and undertook flight training at Hondo AFB & Reese AFB, Texas. Served as as a Test Pilot at Edwards AFB, California, and Wright-Patterson AFB, Ohio. 1961, Graduate of USAF Experimental Test Pilot School. 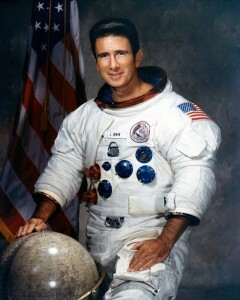 1963, Graduate of USAF Aerospace Research Test Pilot School. From 1964 until selection by NASA, Chief of the Advanced Requirements Branch at USAF Air Defense Command Headquarters. June 1968, Crew CDR of the LTA-8(Lunar Test Article) mission, which completed the first thermal vacuum tests for the Lunar Module(LM). July 27 to August 7, 1971, LMP of the Apollo 15 mission, the first Apollo mission to the mountains of the moon and the first of the “J” series missions which featured the Lunar Roving Vehicle(LRV). Upon his resignation from NASA he formed the “High Flight Foundation”, in Colorado Springs, Colorado. He acted as Chairman of the Board and was active in Christian Lay Ministry. Author, “To Rule the Night”, 1975. 1982, Led an expedition to Mount Ararat, Turkey, in search of Noah’s Ark, reaching the 16,946 foot summit, but finding no evidence of the Biblical ship. He suffered major physical injuries during the descent from the summit and had to be carried down from the mountain. 1983, Led an aerial survey mission to Mount Ararat in a second attempt to discover the last resting place of the Ark. It was unsuccessful. Continued his work with “High Flight” until his death by heart attack on August 8, 1991 at the age of 61. 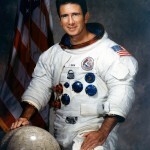 He was the 8th man to walk on the moon.